Although the Positive Thinking Diet is not about losing weight, there are many ways to improve your mood through food and vitamins. For over ten years, I have been following the latest medical and scientific research on nutrition and mood. At first, I was doing research to find out what I might be able to do to help out with my own mild depression and SAD (seasonal affective disorder due to lack of sunlight). Over time, I tried a lot of different things and figured out what foods, vitamins and supplements work best for my own body. Of course, I exercise too, but exercise alone is not enough. Some of my friends began asking me for suggestions for ways to improve their mood through what they ate. So I thought I’d post some of these suggestions. (Legal disclaimer: I am not a medical professional and these ideas are not going to be right for everybody. This is not a substitute for seeing your own doctor and following their recommendations. If you are severely depressed or thinking about doing harm to yourself, stop reading this now and instead call the National Suicide Prevention Hotline at 1-800-273-8255). OK- on we go! Protein: When we eat plant, dairy and animal proteins, they are digested and synthesized into important Amino Acids, which affect our brain chemistry and emotions. Serotonin is one of these amino acids that is well known for creating a feeling of well-being. Fish, Eggs, lean meats (Poultry, Beef, Pork, etc), Yogurt, Milk, Cheese, Beans and Legumes are all high in protein. I make sure to have some protein with every meal. B-Vitamins: There are lots of B-vitamins, and most of them are very good for reducing feelings of stress and providing increased energy. I take daily all-around B-complex vitamin supplements, but particularly B-6 and B-12. Foods that are high in B-vitamins include poultry, seafood, whole grains, legumes (beans, lentils), potatoes and bananas. Omega-3 Fatty Acids: A diet high in Omega-3 Fatty Acids is known to improve mood. Omega-3′s are prevalent in fatty fish (like Salmon and Tuna), and in “pastured eggs” from Chickens who are allowed to roam freely outdoors and eat grass and bugs. You can often find these at your local farmers market. If you do not have access to these foods, there are many good Omega-3 supplements on the market. I take a twice daily supplement of at least 1 gram of Omega-3 Fatty Acids, including the EPA and DHA forms, from http://www.SwansonVitamins.com. Trader Joe’s also carries a high quality Omega-3 supplement. Vitamin D and Sunlight: Vitamin D is produced naturally by your body when you are exposed to sunlight and it’s no wonder that people who live in sunny places tend to be “happier” than people who live in dark or overcast places. Unfortunately, many of us don’t get enough sunshine where we live to produce all of the Vitamin D we need to be happy. When I lived in Seattle, my nutritionist told me that most people who live north of the San Francisco Bay Area don’t get enough sunshine and should be taking Vitamin D supplements – about 5,000-10,000 IU per day, depending on the person and where they live. She recommended that I take Vitamin D3 droplets, which are super inexpensive at most vitamin supplement stores. I get mine online at SwansonVitamins.com. Can’t beat their prices. These days, I’m back across the bay from San Francisco, which often has cloudy/foggy summers. So even people in San Francisco can benefit from taking Vitamin D supplements. Another good source of Vitamin D is mushrooms. I love mushrooms, and buy locally grown mushrooms at Berkeley Bowl and farmers markets. Probiotics: By now everyone has heard that “good bacteria,” like that found in yogurt, can aid in your digestion and help you get the most benefit from all the nutrition from the foods we eat. They also help your mood. So I eat about a cup of 2% fat plain Greek Yogurt with berries every morning. Greek Yogurt is strained, so it is thicker and less runny that regular yogurts. Plus, it contains more protein and calcium than regular yogurt for the same volume. Most yogurt contains plenty of probiotics, but if you don’t like yogurt or cannot eat dairy, you can easily find Probiotic supplements at your neighborhood vitamin store, grocery store or Trader Joe’s. Nuts and Selenium: Nuts are high in unsaturated fatty acids such as Omega 3′s, fiber, and Selenium, which helps regulate the Thyroid gland and promotes the immune system. Nuts also help lower bad cholesterol (LDL) and protect the heart. Nuts with high selenium content include Brazil nuts, Sunflower seeds and Walnuts. Seafood, mussels and oysters are also high in Selenium. Instead of reaching for processed snacks like Pretzels or Potato Chips, try eating some healthy nuts instead. Dark Chocolate: Dark Chocolate contains theobromine, an alkaloid found in the Cacao plant. The higher percent of Cacao in your chocolate bar, the higher the amount of theobromine. Theobromine is known to have a mild stimulant effect and also dilutes blood vessels, which has the effect of lowering one’s blood pressure. 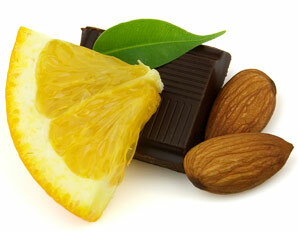 Many people believe dark chocolate is an afrodisiac and helps increase sexual desire. I don’t know if that’s been medically proven, but it’s certainly nice to think so. And it tastes good too! I like to buy Trader Joe’s Pound Plus Dark Chocolate with Almonds. Yum! Selzer Water with Fresh Lemon, Mint and/or Pickled Ginger: My favorite drink of choice these days is Selzer Water with fresh sliced lemons, mint leaves, and/or pickled ginger – the kind that is served alongside sushi in Japanese restaurants. Selzer water is carbonated water without added sodium, so it is healthier for you than Club Soda. The aroma of lemon slices or citrus always lift my mood. And adding pickled ginger, which can be found in ethnic and Japanese groceries, adds a zingy and slightly sour taste, without the sweetness found in most ginger ales. Try it sometime! Green Tea: Green tea is chock full of anti-oxidants and also has some caffeine – but less caffeine per cup than coffee – so you get the energy boost without the jitters. A hot cup of green tea can also be relaxing and help improve your focus and concentration. I always feel more productive after drinking a cup of hot or iced green tea. My favorites are Jasmine Green Tea and fruit-flavored green teas such as Mango Green Tea. I make a pot of green tea in the morning, and drink a hot cup, then pour the rest in a pitcher to drink casually throughout the rest of the day. I hope this information helps some people!